Most people, smokers and non-smokers alike, are surprised to learn that cigarette smoke contains radioactive particles. Even more shocking is the fact that when inhaled, these particles lodge in the lungs and stay there. Lead-210 (Pb-210) and polonium-210 (Po-210) are poisonous, radioactive heavy metals that research has shown to be present in tobacco smoke. What are they and where do they come from? 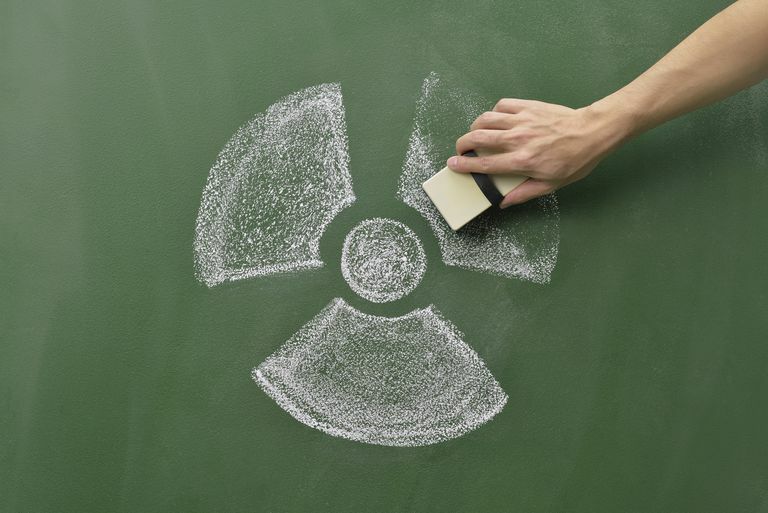 When uranium, an ore that occurs in small amounts in nature, breaks down, radium is released as radon gas into the atmosphere. Once that occurs, radon gas decays quickly, producing lead-210 (Pb-210) and polonium-210 (Po-210), highly radioactive metals (known as radon decay products). Radon gas is the second leading cause of lung cancer, claiming approximately 21,000 lives in the United States every year. Cigarette smoking is the first, with approximately 158,080 lives lost to lung cancer annually in the U.S.
Radon gas released from the soil can seep into buildings through cracks in the foundation. This is a concern in homes where we spend most of our time. If you're concerned about radon gas, look into having the air in your home tested and, if positive for radon, putting a venting measure in place. Radium is also present in phosphate fertilizers that are often used in tobacco farming and contributes to the amount of radioactive particles that are in contact with tobacco plants. As radium in the soil around tobacco plants releases radon gas, tiny lead and polonium particles float free and attach to bits of dust that are carried to the surface of tobacco leaves. These radioactive particles attach themselves to tobacco via the thousands of fine hairs covering the bottom surface of the leaves. In this way, radiation is transported from the field to the processing plant. Once there, the tobacco leaves are washed, but because Lead-210 and polonium-210 are both insoluble in water, the particles are not removed. Lead-210 and polonium-210 are present in finished tobacco products that go out to consumers. In the case of cigarettes, these radioactive particles ultimately find a home in smokers' lungs. In a study published in the American Journal of Public Health, researchers reviewed more than 1500 tobacco industry documents. They discovered information that indicates the industry was aware of the dangers associated with polonium in cigarettes for over 40 years. They hid their research in order to keep the public in the dark about radioactivity in cigarettes. What Happens When You Inhale Radioactive Metals? As a smoker breathes in cigarette smoke, lead-210 and polonium-210 "stick" to the cigarette tar that collects at the junctions of air passages within the lungs called bronchioles. Studies have shown that lead-210 and polonium-210 build up at these locations and over time produce radioactive hot spots. In particular, polonium-210 emits alpha-radiation, which can seriously damage DNA. Inhaling lead-210 and polonium-210 is a significant risk factor for lung cancer because the build-up of radioactive particles in the lungs of smokers is cumulative and permanent. Radiation absorbed into the body is measured in units called rads. Research has shown that 15 rads of polonium in lab mice can cause lung cancer. That amounts to about one-fifth of the rads absorbed by a smoker who smoked 2 packs a day for 25 years. Scientists looking at the lung tissue of smokers who have died of lung cancer found that in most instances, 80 to 100 rads of polonium-210 had accumulated in the tissue. Anyone who breathes in secondhand smoke exposes their lungs to the same toxic heavy metals that are associated with causing lung cancer in smokers. Approximately 7,330 lung cancer deaths in the United States today are caused by secondhand smoke. Further, these toxins are just two of the hundreds of poisonous and/or carcinogenic chemicals present in cigarette smoke. Thirdhand smoke is the particulate residue from cigarette smoke that lingers in the air and settles on surfaces in enclosed spaces. It carries all of the same dangerous toxins that mainstream and secondhand smoke do, and is a particular threat to young children, who may touch tainted surfaces and then put their fingers in their mouths. Polonium-210 cannot be absorbed into the body from contact with intact skin or mucous membranes. However, in the case of secondhand smoke, it is hazardous when inhaled, and thirdhand smoke, when ingested. To date, scientists have discovered more than 7,000 chemicals, including 250 poisonous and 70 carcinogenic compounds, in cigarettes and cigarette smoke. Some chemicals are byproducts of combustion, some are additives that tobacco manufacturers use to affect taste, burn time, and more. Tobacco is responsible for more than 440,000 deaths in the United States each year. Around the world, that number rises to 6 million, including more than half a million non-smokers who were exposed to secondhand smoke. The toxins in cigarettes and cigarette smoke cause numerous types of cancer, heart disease, and COPD. Radiation plays a deadly role as well. There is no safe level of exposure to cigarette smoke. If you're not a smoker, but are exposed to cigarette smoke in enclosed spaces, you face similar risks that smokers do, including lung cancer and other smoking-related cancers. Stay away from cigarette smoke. And if you smoke, the best thing you can do for yourself is quit. Learn what you can expect when you quit smoking and what you can do to minimize the discomforts that come with nicotine withdrawal. Also, find a support group. There is nothing better than the help and camaraderie that comes when you connect with people who understand what you're going through when you quit smoking. Here's the bottom line: don't fear quitting and don't put it off. The sooner you get started, the less the damage to your health. American Lung Association. Lung Cancer Fact Sheet. Reviewed November 3, 2016. American Public Health Association. Waking a Sleeping Giant: The Tobacco Industry's Response to the Polonium-210 Issue. September 2008. Centers for Disease Control and Prevention. Polonium Factsheet. Environmental Protection Agency. Radiation in Tobacco. Updated December 5, 2016. National Institutes of Health. National Center for Biotechnology Information. Alpha-Radiation Dose at Bronchial Bifurcations of Smokers from Indoor Exposure to Radon Progeny.